Talia performs contractor drilling services related to geotechnical and environmental investigations. We perform auger, coring, overburden (ODEX), direct push probe and rotary drilling. Talia also performs hand augering for inside of structures or where a drill rig has no access. Geotechnical drilling includes a range of drilling and sampling techniques that are used by civil engineers and geologists to determine soil and rock characteristics for construction and soil stabilization purposes. Environmental Drilling is performed when soil or groundwater samples are required in order to assess an area for contamination. Talia environmental drilling includes hollow-stem auger drilling and direct-push or probe sampling. Hollow-stem auger drilling is a drilling method that uses flight-style augers with hollow centers to drill soils to depths of up to 200 feet. Soil samples are obtained by periodically driving hollow spoons down the inside of the hollow augers ahead of the cutting bit. Direct-push, or soil probing, is a basic sampling method whereby a hollow sample tube is driven to depths of up to 50 ft.
Talia owns and operates 4 drill rigs ( CME 45, CME 75, CME 750 and Mobile B59). 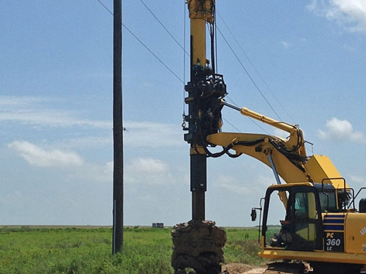 Drilling methods include AUGERING, OVERBURDEN, ROCK CORING and DIRECT PUSH. Our CME 750 Buggy rig allows us accessibility to rough terrain.